Be the first to share your favorite memory, photo or story of Julia "Judy". This memorial page is dedicated for family, friends and future generations to celebrate the life of their loved one. 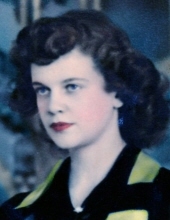 Julia Ann McCarty, daughter of Wilma and Howard Gillespie, was born on November 21, 1928. She passed away surrounded by her family, Tuesday, March 26, 2019, at the new Homestead in Guthrie Center, Iowa. Judy married the love of her life, Donald Ray McCarty, August 1, 1949. They made their home on the McCarty Farm west of Guthrie Center. She received her teaching degree from U.N.I, taught kindergarten for many years, and later enjoyed subbing in all grades. She enjoyed helping and making a difference in the lives of children. Judy was a great example of kindness, caring, and unconditional love. Judy was a long time member of Bowman Chapel Methodist Church. She was an active member of many organizations including P.E.O. and U.M.W. She loved playing bridge, family vacations, water skiing, fishing, and spending time with family and friends. She is preceded in death by her parents and husband. She is survived by her children Cindy, Bill, and Candy, 8 grandchildren, and 13 great-grand-children. She will be greatly missed by all who knew and loved her. To send flowers or a remembrance gift to the family of Julia "Judy" Ann McCarty, please visit our Tribute Store. "Email Address" would like to share the life celebration of Julia "Judy" Ann McCarty. Click on the "link" to go to share a favorite memory or leave a condolence message for the family.